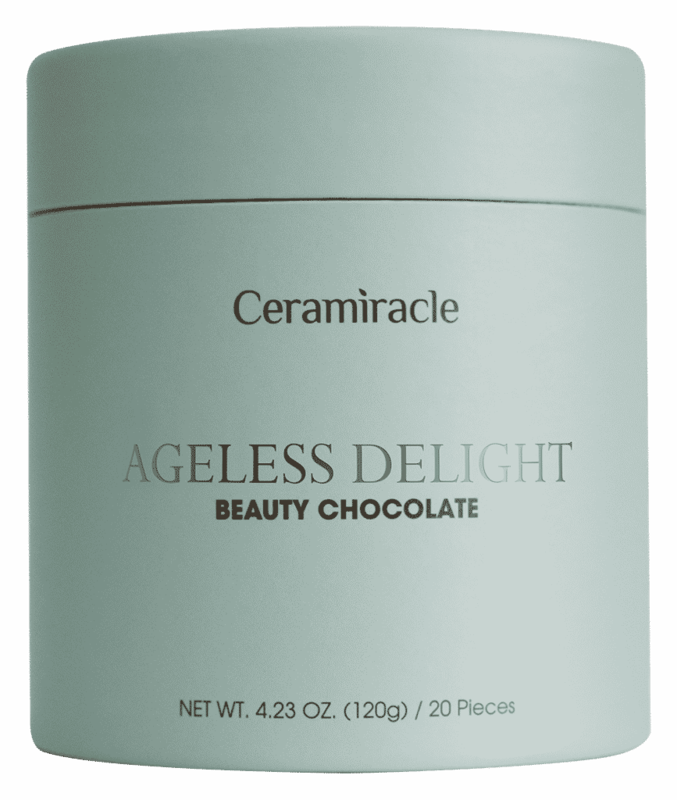 Ceramiracle Ageless Delight is bridging the gap between food and beauty with everyone’s favorite treat – chocolate. If you are someone who is looking for a beauty supplement that promises to rejuvenate your skin, and also love the taste of chocolate… I think you just found your Nirvana. This product promises to bring forth a natural ageless radiance all while satisfying your dark chocolate needs. It’s the beauty supplement we’ve all been waiting for! Did you know that dark chocolate contains nutrients that actually positively affect skin health? Yes, it is a true source of antioxidant. 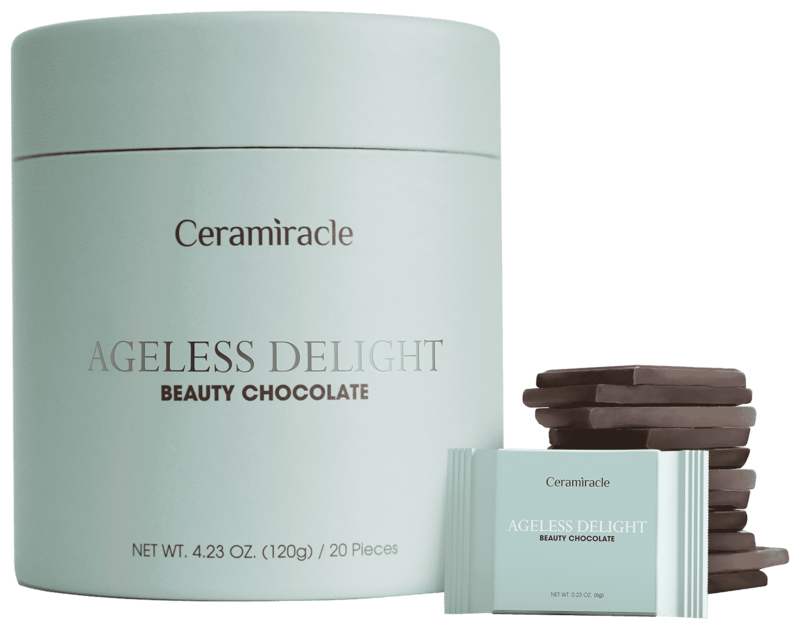 Each box of premium Ageless Delight Beauty Chocolate supplement contains 20 solid mini dark chocolate bars infused with skin-benefiting ingredients such as fucoidan, polyphenols, and phytoceramides. protector of the skin’s natural elasticity, keeping away telltale signs of aging, like wrinkles and fine lines. Polyphenols are naturally packed with antioxidants which aids in skin firming and rejuvenating its appearance. Phytoceramides help to recreate the protective skin layer that has been lost to time. By binding the skin together and locking in moisture, it improves the skin’s density and restores elasticity. So often, we tend to our skin once damage has already occurred. We try to fill fine lines with creams and lotions that promise to add elasticity and fullness. Bandaids if not managed properly. If you truly want to get to the root of the issue, you have to start within. While chocolate may be a guilty pleasure, this supplement will be a treat you no longer have to eat in secret. Made with 70% organic South American Dark Chocolate, this new addition to your skincare routine is the answer to youthful radiance. The supplement is vegan, cruelty-free and xylitol-sweetened with no sugar. Contains NO fillers, preservatives, dairy, eggs, fish, crustacean shellfish, tree nuts, peanuts, wheat, soybeans or artificial flavor. For more information on Ceramiracle Ageless Delight Beauty Chocolate supplement, visit ceramiracle.com. Retails for $45 USD / box of 20 individually packed pieces.